“Today, there have hardly been any migrants arriving at the border in Salloum. Maybe that is a consequence of the no-flight zone that was decided yesterday. We don’t know yet. The tension among the Chadian migrant workers however, who have been stuck here for up to two weeks, is growing. Some of them have been on hunger strike and refusing liquids since this morning. Another group armed itself with sticks and demanded to speak to embassy representatives. They want to go home! We are trying to calm down the situation. “Yesterday, I travelled to Salloum from Kairo. The trip by bus and taxi took me about eleven hours. I came to Salloum to join colleagues from CRS ( a Caritas member) and help them with emergency food distributions. I was told that in the previous days, a few hundred Libyan families and Egyptian migrant workers were passing the border every day, but that there were only around a dozen people from other nationalities. These last can’t enter Egypt since they don’t have a visa and so they are stuck at the border camp in Salloum and need to be taken care of until they can leave. 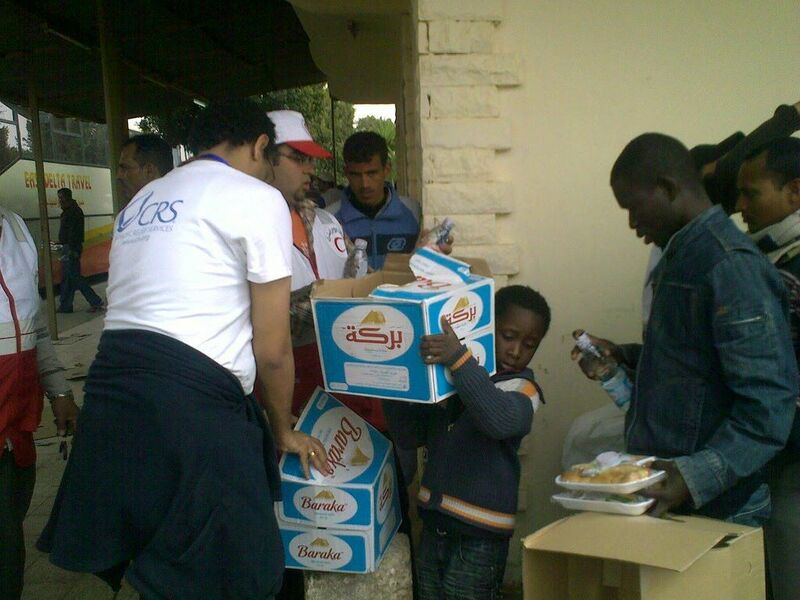 At the moment, around 3000 people are receiving food, hygiene articles and medical care in Salloum. “There were many more people just a week ago. But nobody knows what will happen in the next days. We are still expecting waves of fleeing people. It all depends on how the situation in Libya evolves. “In addition to the current emergency aid being distributed to migrant workers at the border, Caritas Switzerland is already seeking ways to help Egyptian migrant workers returning to their homes. Why they need urgent assistance as well, can be illustrated by the following figures: 4.5 million Egyptians earn their living in another Arab country. At least 1.5 million worked in Libya. Now, thousands of them are returning home. They are not really welcome there though. “Most of the Egyptians working abroad have little or no vocational training. In their host countries, they work as assistants, for example in bakeries, shoe factories or in the construction sector. A lot of these workers are from poor regions in northern Egypt. Unemployment is very high, more than 50 percent among the 16 to 30-year-olds following to a recent UN survey. So people in these regions feel threatened by thousands of returning migrant workers, not only from Libya, but possibly also from other Arab countries where there have been unrests such as Yemen and Bahrain. So there is a lot of potential for social clashes here as well.